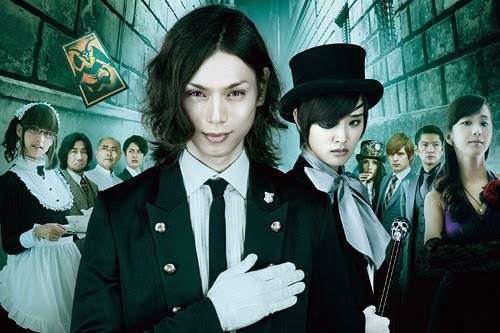 Japanese superstars Hiro Mizushima and Ayame Gouriki star as the ideal master-servant duo in "Black Butler" directed by Kentaro Otani and Keiichi Sato based on the phenomenal manga series of the same title ("Kuroshitsuji") illustrated and written by Yana Toboso. The live-action movie "Black Butler" stars Hiro Mizushima in the titular role, Sebastian, the butler from hell. Sebastian possesses a wealth of knowledge, unbelievable skills, perfect looks and grace, he is a butler without flaws. If one were to find any negative thins about him, it would be his troubling personality. Both the manga and anime are set in Victorian Era London and tells the story of 12-year oldEarl Ciel Phantomhive, Queen Victoria's faithful servant and the most powerful boy in England, but unknown to many , he bears the scars of unspeakable suffering who witnessed his parents murdered. Seeking vengeance, Ciel summons the services of Sebastian and thus becomes the Young Master who carries the devil's mark. In the movie adaptation, "Black Butler" is set in the year 2020, this is a 130-years leap after the events of the manga and anime. The movie brings in a brand new adventure of Sebastian returning to assist a descendant of the Phantomhive family. Sebastian's new master is Kiyoharu,the young leader of the Genpo Group, whose real name is Shiori because she disguised herself as a man to protect her status as heir to their family's estate. Bound together by an unbreakable master-servant loyalty, Shiori traded her sould for Sebastian's service. Both of them carry out secret missions from the Queen. When they are assigned to look into an ongoing serial murder case, Sebastian soon discovers a world that humans should never enter. "Black Butler" opens this July 23 exclusive in SM Cinemas to be distributed by Silverline Inc.